For an overview of the BSA's four High Adventure Bases, click on one of the logos listed below. You will be taken to another official BSA website showing the program opportunities and scheduling requirements. To view a YouTube video and learn more about the fourth and newest High Adventure Base - The Summit at River Gorge, WV - click here. In addition, the Summit is the site of all future National Jamborees and a new National Training Center. Do you know someone else who could use this news update from the Summit? Forward this message to the Scouts and Scouters in your address book! You ask, "What is the Triple Crown? Very few Scouts earn it, but four Scouts and one adult from Troop 36 earned it by attending and participing in high adventure camps at ALL three high adventure bases: Philmont, Somer's Northern Tier, and Florida Sea Base. The patch represents the the three bases by the animal they are associated with: the bull for Philmont, the loon for Northern Tier, and the dolphin for sea base. The boys and leaders participated in the Philmont Trek in northern New Mexico in 2009, the Northern Tier Grand Portage Trek in the Boundary Water Canoe Area Wilderness of Minnesota in 2010 and the Sea Base Bahamas in 2011. All three National High Adventure Programs focus on outdoor skills. Earning the Triple Crown award are Henry Wakamiya (Leader), Alex Heuchert, John Errico, Justin Moore and David Scott Schreiner (adult advisor). John Errico recently earned the Eagle Award. At Philmont in 2009, the group backpacked 75 miles in 10 days. Each day there was a skill participation or demonstration. Northern Tier in 2010 featured a ten-day 125-mile canoe voyage from Ely, Minnesota, to Lake Superior including a nine-mile portage. Fishing and a rendezvous at a Grand Portage National Monument were highlights. This past summer the group flew to Miami and then to the Bahamas for swimming, snorkeling, fishing and exploring islands in the Abacos. 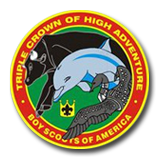 Each participant was awarded the Triple Crown patch featuring a bull, loon and dolphin. Troop 36 is one of the few troops in the Los Padres Council to achieve this award. One of the activities at Philmont was to go out and find “planted victims,” assess the situation and decide on treatment. The boys also viewed the only existing T-Rex fossilized footprint. Northern Tier was the most demanding as the boys paddled about twenty miles per day and carried canoes and gear on portages up to 8.5 miles. They also caught crayfish and smallmouth bass and cooked them. Sea Base featured a 50 foot boat sailing from Cay to Cay. The Scouts viewed barracuda, lionfish, blowfish, lobster, bottle-nosed dolphins, upside down jellyfish as well as snorkeling above a shipwreck. The boys divided into two crews alternating between cooking and sailing the ship. Schedules were changed daily. On each outing other boys and adults from the troop participated ranging from six boys and two adults on the Minnesota trip to nine boys and three adults on the Bahamas trip. Los Padres Council offers a number of High Adventure Awards that can be earned by Scouts of not only this Council but other Councils as well. These awards promote the many unique trails and community features of our South Coast. All awards are approved and maintained by the Los Padres Council High Adventure Team (HAT) under the leadership of Council Vice President for Program, Lynn Johnson. In order to be eligible for any of these awards, leaders must ensure that their Scouts comply with the General Instructions for Cub Scout Awards or the General Instructions for Boy Scout Awards. Don't spread germs! Learn the proper method for washing and drying dishes. December 2016 issue of Waypoints details registration and lottery information for National Adventure Bases and National Jamboree. A series of patches and devices for camping, hiking, biking, horseback riding, or river rafting. Check out whether you qualify for any or all of these patches. This is an individual award offered to a boy who can demonstrate to the satisfaction of his Scoutmaster and to the High Adventure Team of Los Padres Council that he has satisfactorily lived up to the Outdoor Code and met the requirements of this award for a period of at least twelve (12) months. A High Adventure Award that requires four days on the water (such as canoe portage) and an understanding of all safety rules that apply to transportation on the water. Take a longterm backpack trip with four required conditioning hikes prior to the longterm. All High Adventure Awards must comply with the General Instructions for the issuance of awards. The awards listed here apply to Boy Scouts and Venturers. General Instructions for any High Adventure Trip for Cub Scouts and Webelos. These instructions are in addition to any specific requirements in the description of a particular award. The Lopez Canyon Backpack is designed to be done overnight and has a duration of about 10 backpack hours. It is intended to enhance knowledge and appreciation of the relationships between land and water are the variety of uses that man has devised for these two primal natural resources. Los Padres Trails award requires two overnight hikes on approved trails within the Los Padres Forest during the same Scout year. Two training hikes are also required. This 46 mile round trip in the San Rafael Wilderness of the Los Padres National Forest starts and ends at Nira and may be taken in either direction. This trip should take place in a 4 to 6 day period. This is an overnight backpack of 7.5 to 8.5 backpack hours duration. It is intended to enhance knowledge and appreciation of the variety of environments near the Pacific Ocean on the Central Coast of California. The trailhead is at Morro Bay State Park Natural History Museum. Take an overnight hike meeting the Training Hike Requirements during the Winter months in an area that is covered with snow. This Award has been approved by the National BSA as an approved Historic Trails Award. The Historic Trail, sponsored by the los Padres Council, BSA, was initiated in 1990. The trail is designated to present to its participants the historical significance and natural beauty of the San Luis Obispo County area. The trail is divided into two primary sites: SAN LUIS OBISPO and SAN MIGUEL ï¿½ approximately 40 miles apart. The San Luis Obispo walk is the Path of History with 19 points of interest. The San Miguel tour includes the San Miguel Mission and the Rios-Caledonia Adobe. The trail is suitable for Cub Scouts, Boy Scouts, and Venturers. The award is open to all registered members of the Boy Scouts of America. The Historic Trail, sponsored by the Los Padres Council, BSA, was initiated in 1990 and has been designated by the BSA National Office as an approved Historic Trails Award. The trail is designed to present to its participants the historical significance and natural beauty of the San Luis Obispo County area. The trail is divided into two primary sites: SAN LUIS OBISPO and SAN MIGUEL ï¿½ approximately 40 miles apart. (1) The San Luis Obispo walk is the Path of History with 19 points of interest. (2) The San Miguel tour includes the San Miguel Mission and the Rios-Caledonia Adobe. Answers to questions that are asked of Scouts who do the Santa Barbara Historical Trails Patch. The Santa Barbara Historical Trail Award is a Scout award for those who visit 12 historical sites in Downtown Santa Barbara. See accompanying answer sheet for answers to questions asked along the trail. Effective August 2015 Los Padres Council is no longer sponsoring this award. Much of the property covered in the original itinerary is under private ownership. The Council is unable to obtain authorization for using this property. The Sierra Nevada Mountain Backpack Award requires at least one overnight trip into the mountains (minimum: 7 miles). This award may be earned more than once. The above awards are sponsored by Los Padres Council. Other Councils sponsor similar awards which local Scouts may be eligible. There are over 60 other Awards for Cub Scouts and over 100 other Awards for Boy Scouts and Venturers sponsored by other Councils for which local units are eligible. The Santa Barbara Scout Office has available two publications which can be reviewed containing the list of eligible recognitions from Councils in Southern California, Nevada, and Arizona OR you can download the complete book (in Adobe Acrobat pdf format) by clicking on this link to the Orange County BSA High Adventure Team page. Effective August 2015 Los Padres Council will no longer be offering the Seven Sisters High Adventure Award. Some of the property required to earn this award is in private ownership and the Boy Scouts are unable to obtain rights to cross the property. 1. The unit must plan and participate in an historic activity. 2. Locate an historic trail site and study the information related to the site. 4. Do one of the following: a. Cooperate with an adult group such as an Historical Society to restore and mark all or part of the trail site. OR b. Cooperate with an adult group such as an Historical Society to plan and stage an historical pageant or other public event. Such an event shall be large enough to merit coverage by local press. If "4b" is selected, attach clippings to High Adventure Award form. 5. Comply with the GENERAL REQUIREMENTS. 1. Make complete and satisfactory plans for the trip. 2. Cover a wilderness trail, canoe or boat route of not less than 50 consecutive miles taking at least five (5) consecutive days and nights to cover the trail or route. 3. During the time on the trail or waterway, each person much complete at least ten (10) hours of group work to improve the trail, springs, campsites, portages or wilderness area. Note that in public lands, authority must be obtained in advance for all work other than clean-up. The High Adventure Team Trail Boss Chairman can assist with making the necessary contacts and arrangements. 4. If it is not possible to complete ten (10) hours of work on the trail or waterway, a similar project may be completed in the unit's home area. Pack animals may only be used with the permisison the High Adventure Team. 5. For river trips, a power boat may be used only as a safety boat, and in fact is so recommended, but it shall be used for safety only. Any person who rides in, whose food or equipment is carried by, or whose craft is towed by a power boat is immediately disqualified and shall not receive this award. 6. Comply with the GENERAL REQUIREMENTS. NOTE: The National Council has not approved the use of "scheduled backpack time" and it may not be used for this award.